We are to understand that Jesus Christ is the center of the universe, it is he that the old and new Testaments were written, as opposed to the current theme that salvation is the purpose of God’s word. Salvation is a great benefit of God’s word yet man is not the central theme, God is. It is understanding that all of God’s word centers around the person, message, roles, identity, power and glory of Jesus Christ, wherein every page should lead back to him. It is when we examine the four Gospels as they are meant to be diverse presentations of the person of Jesus Christ that faith grows God’s way, from his word. The following, Part 1 is a short introduction with a chart which explains the differences found in the 4 Gospels, which are four different perspectives in order to give insight into prophetic fulfillment, explain complexity, highlight detail, and to gain clarity concerning the role of Jesus’ first visit to earth; commonly called The First Coming (This teaching originated around the fourth century, commonly presented within Catholicism, before it became what it is today, and is referred to as “The Four Evangelist,” as a reference concerning the symbols built-in to the four Gospels as typified by the image on the above regarding the four-fold mission of Christ. This teaching was commonly taught up to 100 years ago in Orthodox Protestant churches, with paintings such as these commonly seen on the walls of Lutheran, Episcopalian, Methodist, and Reformed churches – See Endnote A). Part 2 will be published at a later date. It includes this information, plus adds other information concerning these 4 perspectives concerning Jesus Christ as found in the Old Testament. What is amazing about the 4 Gospels is that they not only appear to be quite different from each other – but are meant to be so, on purpose. John is purposely excluded from the synoptic presentation of the Gospels due to the fact that it is obviously not meant to be chronological as far as time; John presents events by grouping them together based upon their importance, and not the time sequence. Though this idea seems dishonest to the Western way of thinking, to the Hebrews this was often considered a more legitimate way of laying out of events, based upon their importance, and how they relate to each other; rather than the limitation of a time sequence, chronologically speaking. What becomes unfortunate about attempting to plot the three Gospels on a single timeline is that they were never meant to be looked at in this manner, comparatively speaking. What is amazing is the willingness of the world to accept a baby Jesus who is powerless, at Christmas time; at the expense of forgetting His Second coming where He comes as the Warrior of Israel, the Messiah who will save Israel and destroy its enemies, with His enemies blood up to His bridle (Revelation 14:20), the Judge of earth (Revelation 6:10), who will reign for 1000 years (Revelation 20:4) with a rod of iron (Revelation 12:5; 19:15). How many people will accept a baby, but refuse the King. Jesus’ had a particular role in His First Coming – He was meant to be the Lamb of God who would die for the sins of the world (John 1:29, 36). It is the Jesus of the Second Coming, the Warrior King who destroys the enemies of Israel, this is what the Jews were looking for in the First Coming. However, God displaying His ingenious Wisdom by mixing prophecies of the first and second coming without a distinction between the two, wherein the Jew would only see him in the role that fit their own desires – a savior that rules in power and destroys enemies, refusing to even considering the prophecies which displayed Jesus as the Lamb before the slaughter. This is why for centuries they actually tore out the middle section of Isaiah, which were prophecies concerning the Messiah as the suffering servant as seen in Isaiah 52 and 53, as well as many other passages which display the Messiah as God’s representative who would suffer and die. Then came the Dead Sea Scrolls, where copies of Isaiah dated further back had the middle chapters which included chapters 52 and 53; They had to say that these were part of the original book, though now they had to reshuffle their deck stating that the previous chapters written by the great profit concerning the Messiah would seem to align with these chapters were actually not speaking of the Messiah at all. Their contortion could not even facilitate a suspension of disbelief grand enough to accept this ridiculous explanation. They refused to see that God needed to deal with their sin first by dying for them, before He would come back and physically fight for them. How marvelous is our God that He could hide prophecy in plain sight, foretelling of two visitations without referring to them separately in order that Lucifer and his minions would be unaware that there were two visits. Wherein they thought to kill Jesus before He came to power; never realizing the grace and mercy of God Would be displayed in Jesus dying for our sins before He would come and claim that which he paid for thousands of years later – how great is our God. The Gospels is meant to be 4 different perceptive of Jesus, having different goals in displaying 4 roles He was meant to fulfill in His First Coming. This is why it is so important for us to understand that the Gospels were always meant to be diverse – To be different one from another so that we could understand Jesus First Coming in all the shades of nuance wherein Jesus would fulfill all the diverse prophecies concerning who He is, and what He was here to do. Next week we will present Part Two which connects these four perceptions of Christ with Old Testament figures and types displaying God’s wisdom and design going back to the beginning. This is believed to be from prior to the reformation, by followers who would later become the leaders of the reformation. 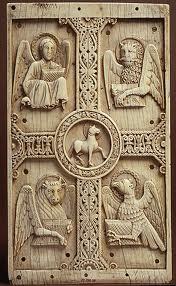 The above plaque of the 4 figures of the 4 books of the Gospel (the Lion, the Ox, the Man, and the Eagle), with the Lamb of God in the middle – is over 1600 years old, created 400 hundred years after Christ, displaying an early understanding of the diversity of the 4 different Gospels. The writings of Irenaeus (who was a disciple of Polycarp, who was a disciple of John the author of the gospel, the 3 letters, and the Revelation of Jesus Christ); referred to these 4 perspectives of these 4 Gospels, which were commonly accepted as canonical at his time. The Catholic Church has displayed these 4 symbols of the Gospels since the time of Irenaeus and is seen in the writings of Augustine, Jerome, and many others. If you enter many Orthodox Churches in American; such as Lutheran, Presbyterian, Anglican, Methodist, and many other churches that are hundreds of years old, going back to the reform movement of Martin Luther in 1517, when he was publicly accused and separated himself from the Catholic Church, you will find references to these 4 perspectives as seen in the 4 Gospels. B. The term in Luke 3:23 is nomizo in Greek: meaning: “reckoned as by law.” Joseph was adopted by Heli, Mary’s father in accordance with the Torah for inheritance through brother-less sisters given to Zelophehad (Numbers 27:1-11; Joshua 17:3-6; Ezra 2:61; cf. Nehemiah 7:63; Numbers 32:41; I Chronicles 2:21-23, 34-35). D. Holman Bible Dictionary, Holman Bible Publishers, Nashville,Tennessee, 1991, Page 900, 920. (Note of Interest: In 1976, my first Bible college class was on the Synoptic Gospels, which shook my faith in observing the contortions that the teachers attempted to go through to rationalize, and explain away the diversity of the Gospels. My faith was shaken, and as time went on I found more and more professors that attempted to say that many times God’s Word included mistakes, and that God and the words “almost,” or “somewhat” would fit together. It is this kind of faith-destroying teachings that were taught in many seminaries, even more so today, which teach that the Bible is not literal, which left the only rational conclusion, that God wasn’t in total control, and therefore faith was a hit or miss kind of thing. I praise God for His mercy in leading me to godly men who completely believed God’s Word, and trusted God in total faith. Most of all I thank the Holy Spirit for helping me understand that God is in total control, He’s never early and He’s never late, He is perfect and in perfect control no matter what it looks like.